Get the inside scoop from Ecuadorians about Ecuador so you can make informed decisions about whether this country is one that will improve your lifestyle. Ecuador has many advantages, close to North America, just four hours from Miami. Plus the brand new Quito Airport means you’ll arrive to the latest in accommodations. You can choose the perfect climate for you. The Andes offer eternal spring, never really hot, never freezing. 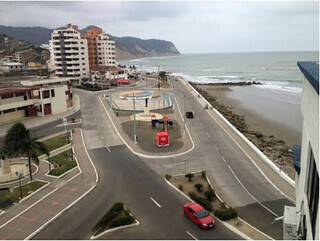 The coast can be warmer, but nowhere in Ecuador are temperatures extreme. You can choose to live in large cities, towns, or small villas. The majority of Ecuador Living readers choose Cuenca. The cool weather, beautiful colonial architecture, and complete infrastructure has attracted over 6,500 expats from around the world. February 25th to 27th, 2015. 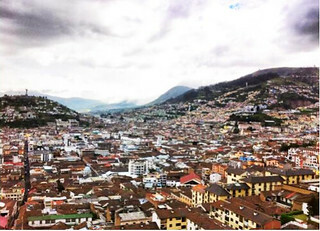 Your Ecuador journey starts in Ecuador’s capital city, Quito. Ecuadorian experts will be there to answer all the questions you’ll want to know, health care, visa, cost of living, real estate, shipping, retirement discounts across the nation and a review of each of Ecuador’s four main zones, Andes, Coast, Amazon and Galapagos. The speakers not only share information but can assist you in getting the contacts and services you’ll need. An Ecuadorian lawyer covers immigration law. Learn what documents you need, how to proceed, how long it will take, how much the process will cost. Dr. Cordova’s law firm has helped expats visas to become residents in Ecuador for many years. Another speaker represents freight companies who can bring your personal goods to you duty free. One expert is in communications. Learn the best ways to make free phone calls back home, how to get a virtual number so people can call you any time, how to watch your favorite TV shows, movies, listen to that local radio stations that you love, get the latest sport news or just read your favorite magazine. You get guidance ranging from how to use Netflix to Zinio, so you can still enjoy those things that you love from back home. Other sessions give you insights into the cultural differences that only Ecuadorians can explain. Learn why when “we” tell you we will meet at 17:00 we arrive at 17:15. Learn how and why “we will be there in 5 minutes” actually means 15 minutes. Find out the difference between formal business meetings and informal gatherings with friends and family. This is important. If you are invited to a party at 20:00, don’t show up on time or you and your host will be embarrassed. Arrive at least an hour late. Pick up all the little tricks you need to know, how to rent a car, how to get around in Ecuador, the best maps for traveling, how to ask for things, the best way to get us to like you, etc. In Ecuador you get the best response being nice and negotiating in a polite way. These cultural nuances will win you friends and bring you business. Meet major developers Armijos and Brito. Their real estate may interest you. These are not fly by night expos who have just arrived ahead of you. Brito has been building in Quito for decades. He recently teamed with Armijos in a new project by the beach, which includes a luxury hotel. You’ll also see an interesting Huasquilla Amazon project of rental units. You’ll see a diverse universe of proposals so you can get an idea of business in Ecuador and how locals are working in Real Estate and finance. Even if you don’t have any interest in buying or owning property in Ecuador, this will give you a perspective of how our economy is doing. Ecuador’s Minister of Tourism will present with its latest investments and opportunities in Ecuador. You’ll see mega projects in tourist areas all around the country and where the growth areas are headed. At the least this Ecuador get together offers the Ministry which Condor, a hotel being developed by Quito’s new airport and outlined private constructions at the coast. A team of Doctors review your health care options in Ecuador. Learn where to get the best eye care, dental implants, medical procedures, prescription savings and natural herbal products. Meet Pro Credit a German bank that especially serves expats in Ecuador. They review the financial health of Ecuador’s banking system, how to bank in Ecuador (if you really have to), the safest way to make wire transfers and the latest news on Ecuador banking regulations. Representatives of freight companies who know how to move your personal goods from your country to Ecuador share how to bring your belongings. Learn the timing, the requirements, pricing, tips on how to label items, how Ecuador Customs processes them, what things to do and what things not to do. They also tell you about the list of things you can bring and what to call them. You might not be able to bring gold, but can bring jewelry components for example. They can provide estimates. 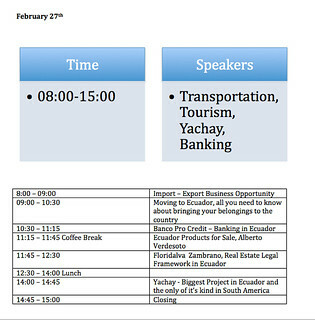 Here is the complete schedule for the Three Day “Ecuador Get Together” in Quito. (click images to enlarge). 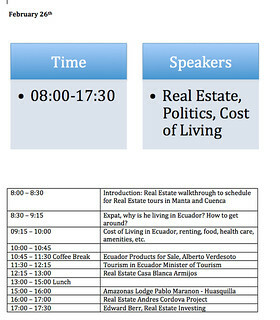 Investment, Real Estate and Get Together complete schedule for our Three Day Get Together in Quito. Since you are coming all the way from your country we’d like you to enjoy as much as you can from Ecuador, so we offer Real Estate Tours, Import-Export and Health Tours around the Seminar. If you like more information and details about those extra activities please contact me at roberto_ribadeneira@me.com. Before the seminar there is a two day Health Care option. February 23rd – February 24th. We will put you in contact with the doctors, this will be prior to your arrival in Ecuador, so they know if you need to bring information and they can plan the appropriate treatment. 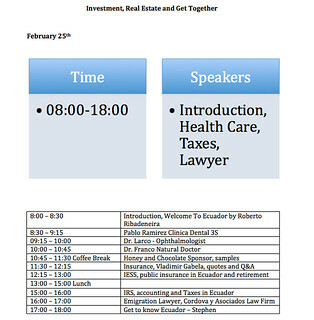 Ecuador Get Together Seminar is February 25, 26, 27. 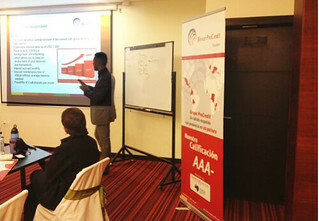 After the seminar there is a five day Real Estate tour to the coast and Cuenca February 28th to March 4th. 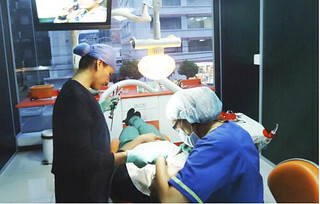 FREE HEALTH CARE TOUR ON PLATINUM AND GOLD PACKAGE! Save $599 on our Health Care, attend for FREE. Get Together, three day Seminar $799 single and $899 couple. 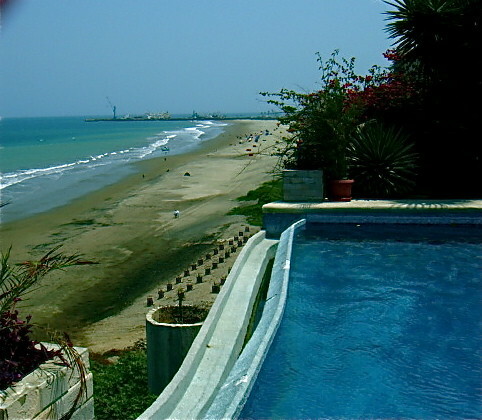 Real Estate Tour (1 tour only, either Coast or Cuenca) $599 single and $699 couple. 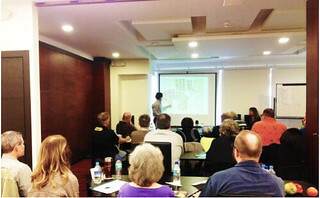 Gold Package, three day Seminar and 1 Tour $1299 single and $1399 couple. Platinum Package, three day Seminar and all Tours $1699 single and $1799 couple. *The schedule during the seminar and speakers may change, but we will guarantee that all major subjects and experience are respected. *Not included. Upon request we will provide pickups at the airport, drop-offs, tours in Quito and/or surrounding areas and tours around Ecuador. We offer a full concierge service in Ecuador for anything that you need.